We had a frost at the house last night. It's the first time we have dropped below freezing this season. I hope it stays cool....It will help keeps the skeeters off during bow season. Lake Champlain water temp is 63 degrees and falling. So, how's the ice fishing in VT? What species do you target the most? Frost on the Pumpkins?....What Pumpkins? According to the StarTrib there is a shortage of Pumpkins this year and they might have to import some from some other state! Something to do with our dry weather this past Summer? Someone better tell the farmers up off of #10 and off #169 to camofladge their fields, cause it sure looks like I can see alot of orange in those fields! The ice fishing in Vermont is very good. We can fish for just about any freshwater species. We normally get ~30-36" of ice by the end of the season. The species we can fish for include: Lake Trout, Land Locked Atlantic Salmon, Cusk (eelpout),walleye, Northern Pike, Chain Pickerel, LMB, SMB, bowfin, brook trout, rainbow trout, brown trout,rainbow smelt, perch, bluegill...the list goes on. I target pike and walleye the most. I also try and fish for smelt, salmon, and several different types of trout. I catch bass, pickerel, and perch (the occasional bowfin as well) as by catch while targeting other fish. My pike spots are pretty good. It's more quantity the quality. Lots of small fish (16"-25")with some bigger ones mixed in. I probably get 4-6 a season over 36". 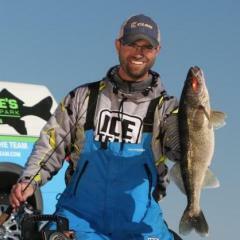 For walleye the tend to be mostly 15"-23" with the occasional hog thrown in the mix. Dry????? Not out here in Vermont. It's been one of the rainest summers on record. Lake Champlain is about 3 feet above normal this year. I hope it is a nice cold and dry winter. BobD....That is a pretty impressive list of target species! We have all except the Chain Pickeral and I would'nt be surprised if one turned up somewhere in the S.E. part of the state. I believe that you have some very good Grouse and Timberdoodle hunting also, plus drop dead fall colors....We do to, (I'm not to sure about great Woodcock hunting, but we do get some.) two beautifull states, Minnesota and Vermont, lots of nature to take in! We have those species as well. Crappie tend to be hit or miss around here.....Other people hit...I miss. If you ever make it out this way, let me know and I'll take you fishing. Just to warn you....You might want to come later in the season. My main pike spot is 1.3 miles out on the lake. It's a long walk when you can't drive out. I don't mind....It give me some space to myself. Yes, we do have grouse hunting. It goes in cycles so some years are better then others. The little buggers don't give you much time to shoot. I've only seen a couple of wookcock, but they may be more common in the southern part of the state. We are lucky in the Western part of VT. Lake Champlain gives us a lot of options on what to fish for.